Branach has supplied a batch of 13 of its popular Industrial duty step platforms to the RAAF for servicing Caribou DCH-4 aircraft. 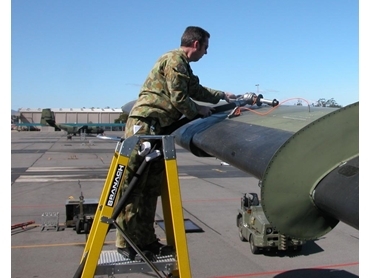 The RAAF appointed AMCE (Aerospace and Mechanical Consulting Engineers) to identify and provide solutions for work at heights associated with the service and maintenance of a range of its aircraft. Risks were identified and products from different companies were trailed in the field over an extended period. In consultation with the users in the field AMCE selected the Branach platform as a safe and stable product. The larger platform area, overall stability and the rear safety rail were key elements in the decision making process. The Step Platforms are available in a range of sizes from 0.6 to 3.6m and in standard and wide versions. The wide version with a rear safety rail was selected with 1.5m high units supplied for work on the Boeing 707's and 2.4m platform height units for the Caribou's. The only extra requirement was that the Caribou units, which operate in the bush in remote areas should be defense force camouflage green. Branach sourced the specified coating and had the fibreglass rails pre-coated prior to manufacture. The low-vis coating highlights the industrial strength of the product.